A book for children 3 to 6 years of age. Contains large illustrations for coloring and few words. It presents the story of a very special missionary teacher who not only taught her students to read and to write, but also to know and love Jesus. 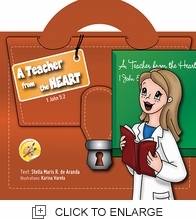 The book contains great activities where parents and teachers can be involved.